Today was a beautiful day! Sunny skies, a continuous breeze, and a high of 74°! You couldn't ask for better weather! It was just me and the girls today. Hayden was off with the in-laws planting flowers and playing. We took advantage of the awesome weather and spent much of the day outside. First, we took a mid-morning stroll through the neighborhood to enjoy the cool morning air. We stopped in the commons and Ella napped in the breezy shade of a tree while Halle played in the playground. She enjoyed collecting acorns, leaves, and rocks and was adamant about keeping all of her treasures! We came home in time to have some lunch and then headed out to run a few errands. I had some materials to pick up for some projects I'm working on so we stopped at a local craft/fabric store. We made the stop, spent about 30 min or so shopping, and then checked out. Since the craft store is just down the street from my hubby's fire station, we stopped in for a visit! The kids always enjoy visits with daddy while he's on duty. 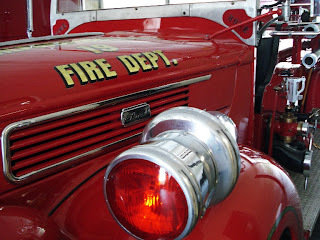 Today, Halle sat in the driver's seat of a vintage 1941 Ford firetruck. It's been restored and is really cool. The equipment sure has changed a lot since then. The little Ford looked so primitive next the the state-of-the-art modern truck they use today. 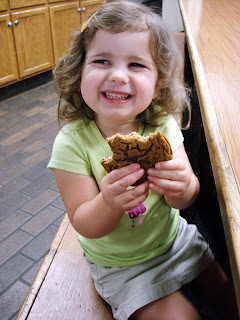 Halle enjoyed pretending in the front seat and then enjoyed an oatmeal cream cookie in the kitchen. Then for some reason, my husband had an overwhelming urge to wash my SUV! I am definitely not one to argue...soooo, Ella and I sat outside on a bench and watched while he gave it a good scrubbin'! Thanks honey! Halle spent the time jumping through all of the sudsy puddles. Once my Pilot was nice and sparkly we said goodbye and headed off. We made one more fabric stop and turned for home. The girls were both asleep when we pulled into the driveway and I was ready to relax. It's always nice to get out but at the end of the day "there's no place like home! ".....ok, it's cheesy....but it's true! Hi Hana! I, too, am a fireman's wife! Rarely do I pull into the station that I don't get a full-on carwash, complete with a chamois drying! I would love to recommend my favorite book: The Fireman's Wife, by Susan Farren. It's down to $11-something on Amazon and you will LOVE IT!! So will your husband.